A new powerful but simple G Guardian for Touken Ranbu appears. AUTO: When this Unit is placed on (GC), for each face-don card in your Damage Zone, during that battle, this Unit gains Shield+5000. If all of the cards in your Damage Zone are face-down, Counter Charge 1. (If you Counter Charge 1, the shield of this Unit doesn’t decrease.). For Today’s Card, we’re introducing the 【G Guardian】 “Akashi Kuniyuki -Hanamaru-” from the Trial Deck “Touken Ranbu -Hanamaru- Deck Set 2” (on sale October 6th, 2017). 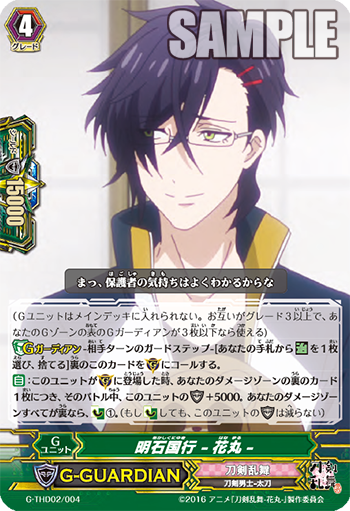 “Akashi Kuniyuki -Hanamaru-” is a powerful G Guardian with an ability. When it’s placed on a Guardian Circle, for each face-down card in the Damage Zone, it gains Shield+5000! And if all the cards in your Damage Zone are face-down, you Counter Charge 1! For example, if there’s 5 cards in your Damage Zone, if they’re all face-down, its Shield becomes 40000. While deflecting your opponent’s attack, you can push forward in your fight while also Counter Charging.